The 2015 discovery by the US gravitational wave observatory LIGO of a distant chirp from the death-spiral of two black holes was a tremendous intellectual, engineering and scientific achievement. 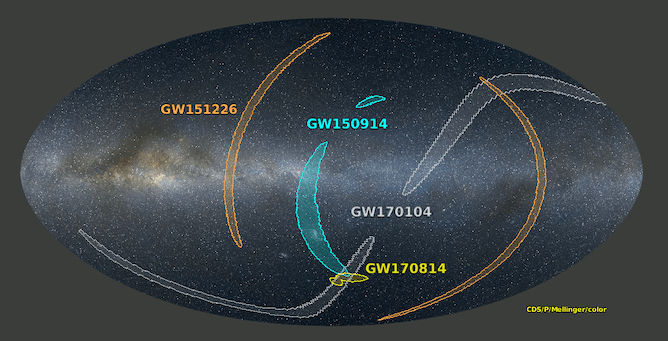 Since then two other black hole mergers (GW151226) and (GW170104) have been identified. A new breed of “gravitational wave astronomers” is now mapping out Einstein’s universe and exploring the most extreme gravitational physics imaginable - the coalescence of black holes. On August 14, 2017, at precisely 10:30:43 the two LIGO detectors (based in the US) and the Virgo detector (based in Europe) felt the characteristic “chirp” of passing gravitational waves. This time the black holes were about 30 and 25 times the mass of our Sun, and almost 2 billion light years away at the time of merger. In many areas of scientific endeavour, competition is fierce, and with hundreds of telescopes distributed around the world there is often a race to beat the competition to astronomical discovery. It isn’t always pretty to watch. Gravitational wave astronomy is quite unique in this regard because it doesn’t make a lot of sense to compete. Unlike light, gravitational waves happily travel through the Earth, and so it doesn’t matter where the Earth is pointed at the time of events. So no matter where you build your gravitational wave detector it can be part of a global network! And there are handsome dividends to be earned! Unlike the first three gravitational waves discovered, this time the delays between the arrival time of the wave at each of the three detectors could be used to “triangulate” the position on the sky. The wave hit the LIGO Livingston detector first, then 8 milliseconds later the Hanford detector saw the wave, and 14 milliseconds later the wave “arrived” in Europe - much to the delight of the Europeans! The presence of the third gravitational wave detector greatly reduces the “error box” of the wave’s origin. In this case the potential sky localisation went from over 1,000 to just 60 square degrees. Sadly, when black holes merge there isn’t much left over to see! So although the location of the black holes may be restricted to only about 0.15% of the sky, their home galaxy is still a mystery, as many galaxies occupy the “error box” at the distance of the merger. But there are other advantages to Virgo joining the global network. The twin LIGO detectors were deliberately oriented in the same way, so that they could confirm each other’s potential detections. That strategy made a lot of sense when nothing had been discovered yet - but not perhaps now. To discover a gravitational wave requires a massive computational effort of vast areas of “phase space”, and it is hard to be convinced of the statistical significance of an event if there is only one detector in operation. When two detectors see the same pattern the chance probability of a fluke is greatly reduced. With a third the statistical significance is even further enhanced. The Polarisation of Gravitational Waves Perhaps the greatest benefit of the inclusion of the third detector was the first detailed exploration of the waves’ polarisation. In Einstein’s General Theory of Relativity very specific predictions are made about the polarisation of gravitational waves. LIGO is restricted in what it can say about polarisation because its detectors are co-aligned. The Virgo detector senses the gravitational wave differently, because the arms of its detectors point in a different direction. The LIGO-Virgo scientists’ “triple” detection permitted new tests about the essential correctness of General Relativity (GR). Once again Einstein was proved correct, with alternative theories of gravity failing to fit the polarimetric signature of the waves as well as GR. This important science result was only possible because of the high levels of trust and cooperation between the LIGO and Virgo collaborations. 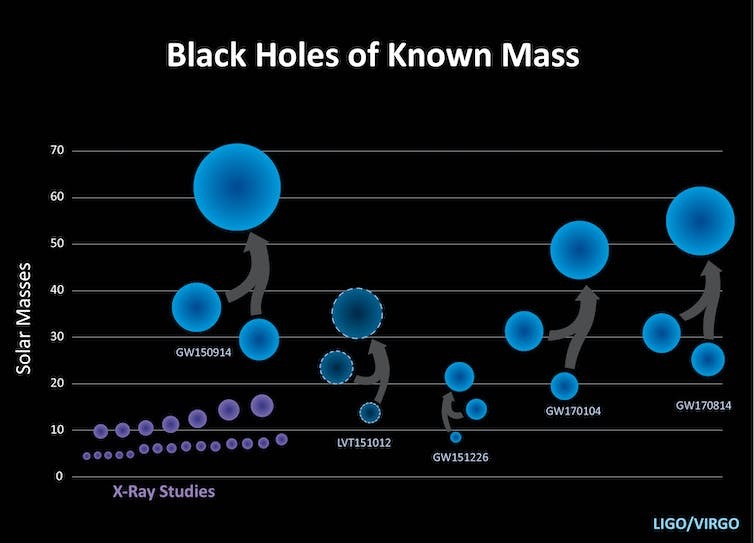 With four black hole mergers now detected, what is the future of this field? LIGO’s second run (O2) finished at the end of August, and the final list of detections is being refined. The detectors are now being “enhanced” and “tuned” for about a year. My colleagues at OzGrav are pitching in, developing exotic tools such as “quantum squeezers” to be deployed for the first time, new cameras and enhancing their data reduction pipelines. When they recommence operations, LIGO expects to be able to see about 30% further into the universe, and detect mergers twice as often. Virgo will join the next hunt, and over the next few years the range and event rates will continue to climb until mergers are being detected every week or so. Japan’s KAGRA observatory will join the network around 2020 and a third LIGO will appear in India some years later. Some jewels remain to be discovered. Astronomers eagerly await other “flavours” of gravitational waves, from those caused by mountains on spinning neutron stars, to bursts from exploding stars and mergers of neutron stars. Now that the universe’s content of hyper-relativistic objects is being calibrated, it is possible to predict with more confidence the benefits of building bigger and better detectors - the so-called “3G” devices. These detectors may comprise of orthogonal vacuum pipes 40km long (the US concept nicknamed “Cosmic Explorer”), or vacuum pipes buried deep underground (Europe’s “Einstein Telescope”) arranged in an equilateral triangle. The technology behind these detectors is awe-inspiring, and their scientific power difficult to comprehend. Cosmic Explorer could see 20 times further than LIGO currently does, and detect mergers 8,000 times as often! Gravitational waves travel through anything unimpeded, so offer a very unbiased view of the universe. This makes them an attractive way to monitor the extreme gravitational history of the universe. I am part of an international team currently working on the science case for a global 3G detector network. Unlike some areas of astronomy, gravitational wave astronomy will always benefit most from international cooperation and contribution towards a global network. Given the amount of science flowing from LIGO and Virgo it is almost certain that the US and Europe will construct these gargantuan 3G detectors in the decades to come. Ideally a third detector of comparable sensitivity should be constructed, and to maximise the science a Southern hemisphere location as far from Europe and the US would be preferred to maximise the scientific yield. Australia has the geological stability, dimensions and technological base to be a part of the next giant leap for this field - but only if its planning processes and political will becomes engaged in the international planning well in advance of construction. Written by Matthew Bailes, ARC Laureate Fellow, Swinburne University of Technology. This article was originally published on The Conversation. Read the original article.